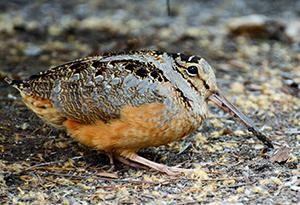 American Woodcock, this shy football-shaped forest bird cuts quite a figure dancing in the sky. In early spring woodcocks are migrating back north to get to their breeding ground, and April is a good time to see them displaying at dawn and dusk. This oddly-shaped bird with a long, straight beak actually is a shorebird. But Woodcocks live in young forests, not on beaches, and they are perfectly camouflaged to blend in with the forest leaf litter. Woodcocks have a strange and halting way of moving, taking hesitating steps, using their long, flexible beaks to probe the soil for their favorite food– earthworms. American Woodcock display grounds are usually open fields that are near a forested area and open clearings in the forest or prairie-savannahs are good places to look. Local birders often know about these display grounds, so contact your local birding club to find out where they are — or go out exploring on your own. The best way to see Woodcocks displaying is to get to the display area just before sunset. As the sun dips towards the horizon, you should start to hear a loud, nasally buzzing sound: PEENT! That’s a male woodcock calling. They call from the ground, emitting a single PEENT once every few seconds. After a few minutes of this, you should see a smallish bird rising high into the sky, accompanied by a twittering sound. The male woodcock will make several circles, wheeling high in the sky. The twittering sound is made by the woodcock’s wings — several primary feathers are stiff and thin and end in a club-like projection. As the woodcock pumps his wings, the force of the wind over these stiff feathers creates the twittering sound. After circling the sky, the male woodcock descends towards the ground in a zig-zag. He will land almost exactly where he started, and will start the display all over again. The display will go on until just after dark, and will begin again in the early morning. But Timberdoodle populations are declining due to many reasons – habitat loss is a major factor as is toxic poisoning from pesticides sprayed to eliminate pests in forests and are often concentrated in earthworms. And Woodcocks are one of the only shorebirds still legally hunted. All combined, these pressures have impacted their populations so that they need significant conservation action to keep populations from declining precipitously.